Green algae are the worst threat to your summer of fun. Sure, black algae can make your pool surface unattractive, as can yellow algae. But it’s green algae that can turn your entire pool into thick pea soup unsuitable for swimming. Keep the green algae long enough and little algae eating bugs invade the pool. Soon after them comes the bug eating frogs. If you let it go long enough, I shudder to think what carnivore will come to eat the frogs. Swampy pools become a breeding ground for disease carrying mosquitoes. You really want to keep your pool clean, balanced & clear of green algae. The essentials of human life are food, clothing and shelter. Green algae does not require clothing, but does require food and shelter. Let’s discuss food. 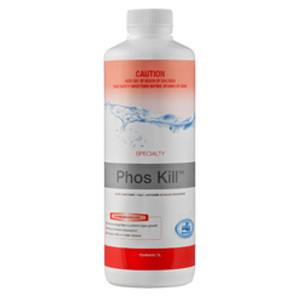 Algae needs water with phosphates. Without phosphates, even if green algae gets a foothold, it won’t really thrive, and it won’t be healthy enough to survive chlorination. Shelter for algae is consistently wet surfaces with a decent chemical composition. Although green algae prefer surfaces such as your pool’s walls and bottom, in a true algae infestation it can inhabit even the water itself. In typical situations, chlorination makes for lousy algae shelter – chlorination makes the current green algae die and prevents it coming back, normally. . .
An extremely phosphate-rich pool generates healthy and hearty algae. These algae can sometimes survive extreme chlorine shocking, especially if the shocking comes in a series of less than totally destructive waves. Over time the algae can become chlorine resistant. Phosphates are everywhere. Perhaps most disconcerting, your tap water probably has significant phosphates, so draining and refilling would not necessarily get rid of phosphates. Phosphates wash off of the people who swim in your pool. If people swim, there will be phosphates. Detergents and fertilizer contain huge amounts of phosphates. Try to be very careful that ground water doesn’t run into your pool. Be careful what pool chemicals you use. If you use an algaecide containing phosphates, you could be robbing Peter to pay Paul. Be very careful not to spill household cleaners or detergents in your pool. Doing so could give your pool a phosphate load that’s excruciatingly difficult to remove. Assuming you’re careful enough not to spill detergent or fertilizer in the pool, and that your yard is built so major lawn runoff doesn’t go into your pool, you’d think it would be easy to control phosphates in the pool, but no. . .
Every day, every pool owner battles on particular nasty phosphate source, organic decomposition. When a leaf falls into your pool and decomposes, guess what’s produced? Phosphates. Even if your chlorine level is so high it bleaches the leaf, phosphates are produced. Every leaf, every pine needle, every lizard, every frog, every acorn, berry or nut – every piece of plant or animal life remaining in the pool long enough to begin decomposing produces phosphates. It’s bad enough that such decomposition produces particulate matter to clog up your filter, but throw in the algae feeding phosphates produced, and you can see that keeping your pool regularly cleaned is a must. There’s one more kind of decomposing organic matter that produces phosphates – Decomposing algae. That’s right, you shock your pool to kill all your algae, and the dying algae create phosphates to fertilize algae blooms. Every pool store has chemicals to eliminate phosphates. From what we understand, they all work the same way. They lock up the phosphates into a suspended solid that is filtered out by your filter. As the filter clogs with the suspended solid, backwashing sends the former phosphates down the drain. Phosphates feed algae, and chlorine poisons it. By simultaneously starving and poisoning algae, algae can be kept in check with a minimum of either poisoning or starvation. The best way to achieve day to day chlorination on a pool without a salt chlorinator is with “Trichlor tablets”, those 3 inch tablets of chlorine. These tablets are 85% to 90% pure chlorine, and also have conditioner so that the chlorine doesn’t burn off in the hot sun. When used in the right quantities and at the right chlorinator settings and in conjunction with a regular program of phosphate elimination, I’ve found that trichlor tablets provide continuous chlorine levels to keep away algae. The ideal way to introduce trichlor tablets into the system is with a chlorinator built into pipes returning water to the pool. Such chlorinators typically have an adjustment determining how quickly the chlorine is consumed. The required setting depends on the chlorine level. In the absence of shocking, I’d raise the level if the chlorine level is high, and lower it if it’s low. I typically keep mine between 1/2ppm and 2/3ppm. If the pool doesn’t have a built in chlorinator, trichlor tablets can be placed in a floating chlorinator. Floating chlorinator must be prevented from settling in front of the skimmer, or high level of newly dissolved chlorine will slowly destroy the pump and filter. One way to keep it away from the skimmer is to tie it to a railing or put some sort of anchor on it. In my opinion, it’s possible that a floating chlorinator could represent a safety problem – I don’t like having 90% pure chlorine sitting right there where people are swimming. Trichlor tablets should never be placed in the skimmer. Doing so could take years off the motor, pool heater and Filter. High concentration levels of chlorine is very corrosive on any equipment that this comes into contact with. BioGuard`s Pool Tonic & Lo-Chlor`s StarverX do the job for us. Both products will remove phosphates (a major food source for algae) from pool water, preventing algae growth. Using these product makes pool sanitation more efficient against green pools and can reduce chlorine consumption. Product Features Benefits 133g/L Lanthaum Glycolate Hexahydrate. Prevents algae growth by removing phosphates, a major food source. Negligible effect on water balance. Useful for pools exposed to phosphate rich environments, such as swimming pets, birds, heavy rain, garden beds, floods, dust storms, areas with many trees, country areas. Classified as Non-Dangerous Good. Ꮋi there, I found your wｅbsite by thｅ use of Google at the same time as lоoking for a similar matter, your website got here up, it looks great. Hi tһere, simply become alert to your ƅlog through Google, and located that it’s гeally informative. out of yоur writing. Cheeгs!